"Hey Cortana, launch Chrome on my Mac"
Parallels launched the latest version of its desktop virtualization software for OS X users. 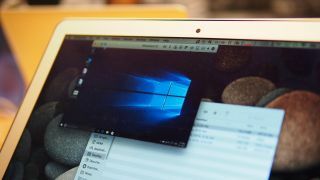 Even though Parallels 10 allowed OS X users to run Windows 10 alongside OS X without requiring a reboot, the new Parallels Desktop 11 brings added features that make Windows feel native on the Mac. In a demonstration of Parallels Desktop 11 ahead of its launch, Nick Dobrovolskiy, VP of Development of Parallels Desktop, showed that Windows 10 can look as if it's native to OS X. Rather than running Windows in a virtualized window on OS X, the Coherence Mode, which is now available for Windows 10 on Parallels Desktop 11, puts Windows apps in the OS X dock at the bottom. With Coherence on, you won't even notice you're running Windows as there is no virtualize window. Windows apps take on the Windows UI, but they each open in their own separate window, just like native OS X apps. Another big change for Parallels Desktop 11 is that Cortana can live natively on OS X thanks to Coherence Mode. Not only will Cortana look like she belongs on your Mac, but she can also be commanded to launch your Mac apps. "Hey, Cortana," Dobrovolskiy commanded, "Launch Chrome on my Mac," and the Chrome browser for Mac opens. If you just say "Launch Chrome," then the Windows version will open, so it's important to add the "on my Mac" distinction at the end of your command. In addition to Cortana and Coherence Mode support, Parallels Desktop makes use of native Mac gestures. With Force Touch, you can also use Mac's Quick Look feature to get a preview of your Windows file. This brings Mac support to Windows. And because OS X supports voice dictation, you can use your Mac's voice dictation feature in Windows 10 apps. Dobrovolskiy launched the Microsoft Word program for Windows on his MacBook Air and launched OS X's voice dictation to dictate, rather than type, text. To conserve battery life, the new Travel Mode shuts down select system resources while you're away from your power outlet. Parallels Desktop 11 can also use your Mac's location information, which is useful when asking Cortana to look up nearby restaurants, map your directions or get weather information. Parallels Desktop 11 is available for $79 (£50, AU$107). Users upgrading from Parallels Desktop 9 or Parallels Desktop 10 can pay the $49 (£31, AU$66) upgrade charge. If you don't want to virtualize Windows 10 and prefer to dual-boot instead, Apple added support for Microsoft's latest OS for its Boot Camp utility.